Plug&Sense!, the professional wireless sensor platform, adds compatibility with industrial protocols RS-232, RS-485, CAN-Bus, Modbus and 4-20mA. Libelium brings over the Internet of Things to Industry 4.0 offering new applications for factory automation, automotive applications, industrial networking, building and infrastructure, transportation, energy applications and military uses. The compatibility added with new industrial protocol modules and API libraries for Plug&Sense! Sensor Platform allows connecting to the Cloud sensor information coming from industrial devices. The new modules support the most widely used industrial communication network protocols such as RS-232, RS-485, CAN Bus, and Modbus, used for process as varied as industrial automation, building automation and automobile applications, for sensor network capability in remote or factory floor environments. In conjunction with the new modules, Libelium has released a special Plug & Sense! model to connect 4-20 mA sensors (current loop), the most commonly deployed in industrial environments. “Interoperability, reliability and scalability are invisible assets required in any IoT project for industrial environments. 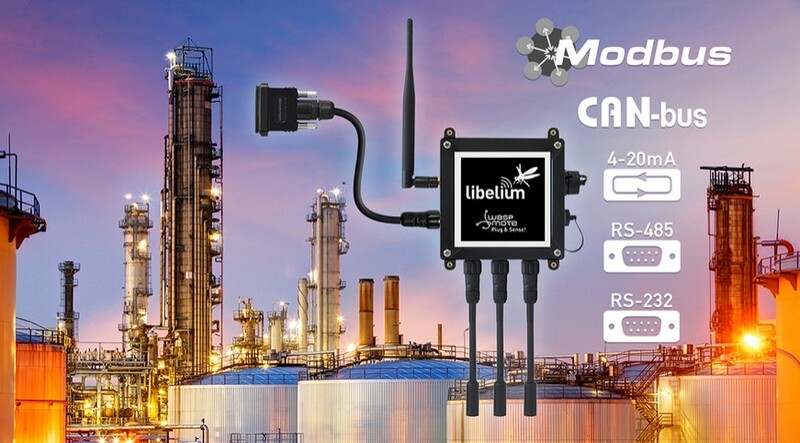 In this sense, we are providing solutions to approach the capabilities of our multi protocol wireless sensor platform to industrial devices”, says David Gascón, CTO at Libelium. Plug&Sense! along with the new industrial protocols modules allows to perform three main applications: connect any sensor to an existing industrial bus, add wireless connectivity to wired buses and connect industrial devices to the Cloud. Plug&Sense! can be configured to work as a node in the network. This way, the sensor information can be read from any industrial device connected to the common bus. The sensor nodes can also use the industrial bus to send information coming from any of the more than 120 sensors currently integrated in the platform. Beside that, Plug&Sense! can be configured to read the information from the bus and send it to the Libelium IoT Gateway using any of the wireless radio modules available: 802.15.4, 868 MHz, 900 MHz, WiFi, 4G, Sigfox and LoRaWAN. Finally, Plug&Sense! can be configured to read the information coming from the bus and send it via wireless directly to the Cloud using WiFi or 4G radio interfaces. Libelium platform is fully certified with CE (Europe), FCC (US), IC (Canada), ANATEL (Brazil), RCM (Australia), PTCRB (US) and AT&T (US).